Een elegante 9000 Sqft 1850 Estate op 3 hectare in het centrum van Stockbridge. 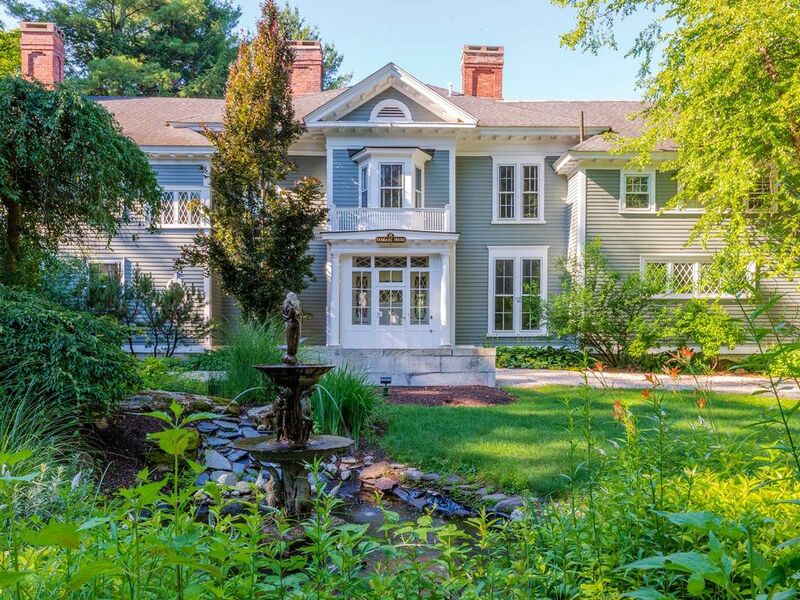 De Taggart House is een groots landgoed in het hart van de Berkshires. Het pand ligt op 5 minuten lopen naar het centrum van Stockbridge, maar toch rustig gelegen op 3 gemanicuurde hectare langs de rivier de Housatonic. De Taggart House werd gebouwd in 1850 door de bekende Stockbridge inwoner Henry Dwight Sedgwick. Onlangs toegevoegd aan het nationaal register van historische plaatsen, de Taggart House combineert prima 19e-eeuwse architectuur met een luxe comfort en moderne voorzieningen. Alle 6 slaapkamers, bovengenoemde hebben hun eigen badkamer. Alle kamers en badkamers zijn in het voorjaar van 2014 gerenoveerd en opnieuw ingericht. Beautiful house and great hosts. Wonderful experience! It was a beautiful home and property with plenty of space for our large group. The owners were supportive and helpful. It is conveniently located to Stockbridge and other local attractions. The home has great character. This house is perfect for a large group. There is so much room to spread out, yet there are great gathering locations with plenty of room for everyone. Our favorite was the sun room where one entire wall has doors that open to the outside overlooking the well-manicured yard. If you are looking for total privacy, you should know the yard is next to the house where the owners live and they are frequently outside maintaining it. They are a friendly, helpful, wonderful couple. The kitchen is well equipped, with everything we needed for when we cooked. The bedrooms, which vary significantly in size, each have their own bathroom which was a huge plus. We really enjoyed our stay, the help of the owners and the location. Perfect family get together! Its not often one is able to say they have a solid group of friends for over 45 years, but I do. We choose the Berkshires to have our reunion to celebrate our 59th and 60th birthdays. There were a group of 14 that started but 2 were unable to attend. One requirement was to locate a home that can comfortably house 3 to 4 couples with each having their own bathrooms. I found the Taggart home. This was the home that would serve as our base lodge. Our group of 6 that stayed in the house did not have one problem. In fact, there was so much room, we all could have had our own private reading area and not been found! The home is magical. A grand estate from other times transposed to provide a home away from home. A place where we could comfortably serve 12 for meals, where we could hang out and talk in groups, where we could enjoy a sunroom for afternoon cocktails and appetizers prior to dinner. A place where we could hang out and play games of pool on the full-size table, where Sonos speakers ran throughout the house allowing us to enjoy music from the past and present (down load the app on your phone). A place that had internet access so we can plan our last minute ventures. Also a place that was easy walking distance to downtown Stockbridge full of its shops, restaurants and The Red Lion Inn, where you can get a coffee and rock in the chairs on the front porch. Also, walking distance to some great trails (The Ice Glen and Laura's Tower Trail). The home also is very close to the Norman Rockwell Museum. I am not one much for art, but the place is well laid out and worth the trip. A few in our group went to Tanglewood and you are very close to that showplace of a venue! George was easy to communicate with and very good to respond to many inquiries along the way. He made the entire process easy from start to finish. The home truly is a Grand Estate. I would not hesitate to book this place again. Do yourself a favor, don't think twice about it, book it, enjoy it, build memories that will last a lifetime. Thank you George for allowing us and others to enjoy your home, its grandness and convenience. This place was beautiful and just as luxurious as it looks online. We were up there with the extended family (8 adults, 4 kids) and we were very happy overall. I was a little concerned that it would feel too formal, but the living room with fireplace was cozy and inviting. The kitchen is eat-in, which is hard to tell from the photos. This was important because we spent a lot of time cooking together and it was nice to have room to hang out. George was communicative and nice to work with. My sister busted a lampshade, but George gave us our full refund back, which was nice. She was not wearing it on her head. Downtown Stockbridge is an easy 10-minute walk. A couple of minor negatives - We ran out of garbage bags. This was a little stressful because there is a strict policy regarding garbage and recycling, which is understandable (have you heard about The Alice's Restaurant Massacre?). Everything was closed for the holiday weekend. Luckily the guy at the gas station around the corner gave me a couple of garbage bags. Also, the fridge was not keeping things cold. We took advantage of the winter temperatures and stored things on the back porch. This may have been because we overfilled it or we were opening it a lot. I think this is the kind of trade off one makes. We could not have had a wonderful experience like this in any hotel, no matter how luxurious. To quote Yvon Chouinard, "It's not and adventure until something goes wrong." Overall, I would absolutely recommend this place to anyone looking for a charming, one of a kind vacation rental for a large group. I have not had a lot of experience with this type of rental. If I do something like this again, I would plan on a run to the local grocery store right away to supplement any of the pantry items that might be low or that might be unique to your needs. We had a family vacation that we will never forget and would love to repeat. Thanks, George! We had a great experience at the Taggart House. The house is elegant yet relaxed with lots of areas for people to gather. Even though it's a large, older home it was warm and cozy. The layout is really perfect for a large family group (we were 12). The kitchen is extremely well stocked: we had everything to cook and serve multi-course dinners. And the dining room is well stocked with linens. The beds are very comfortable, the wifi is strong, great water pressure, and there's plenty of parking. The owner was helpful and made us feel very welcomed - we definitely plan to return and highly recommend the Taggart House. De Taggart House, gelegen in het centrum van Stockbridge, is het centrum van de zuidelijke Berkshires. De Taggart House is gelegen op 3 gemanicuurde hectare met 300 voet van de voorgevel op de rivier de Housatonic met toegang tot water om te kajakken, vissen of zwemmen. De Taggart House is 1 blok naar de Red Lion Inn en de Lion's Den Pub; een 1/2 mijl naar het Berkshire Theatre Festival; 2. 4 mijl naar het Norman Rockwell Museum; 3 mijl naar Beach Stockbridge Town en Stockbridge Bowl; 4 mijl naar Tanglewood en Kripalu; 5 mijl naar Shakespeare & Co .; 6 mijl naar Butternut Ski Mountain en Mahaiwe Performing Arts Center; en 12 mijl naar Catamount Ski Mountain, Jacob's Pillow Dance en The Colonial Theatre. Rental booking contract required. Contact owner with questions.